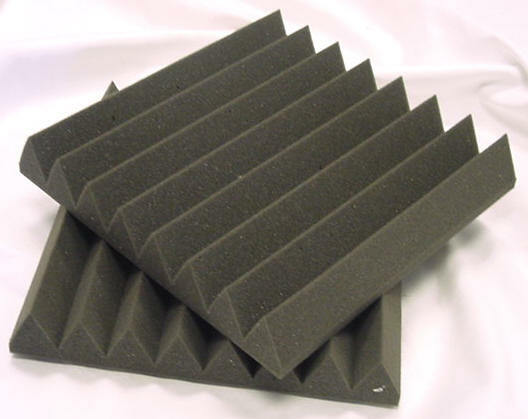 Wedge Foam Tiles treat most small to medium sized areas including vocal booths, control rooms, and studios. It effectively kills standing waves and fluttering echoes. These are a popular choice for sound control in most industrial environments. 1″ Wedge Foam: Recommended for mid and high frequency ranges, and areas that require decent sound control. Note: If you would like to add a 1/4″ Volara Barrier on the backside, this will cost an additional $1.50 per sq. ft.
2″ Wedge Foam:Recommended for most applications and most small to medium sized rooms. This is very effective against standing waves and flutter echoes. 3″ Wedge Foam: Features maximum surface area for greater exposure to sound waves; recommended for all frequency ranges in areas of any size. Note: If you would like to add a 1/4″ Volara Barrier on the backside, this will cost an additional $1.50 per per sq. 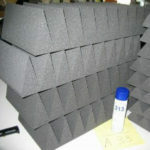 ft.
4″ Wedge Foam: Recommended for medium to large area rooms with pronounced low frequency problems or where sonic accuracy is mandatory & stronger acoustic absorption is required. Product #NC-126 Can be glued from the ceiling to the floor! Our acoustic wall tiles are designed to trap and deflect sound energy. They are made of open cell, flame retardant polyester foam. The design is very pleasing to the eye while offering outstanding sound absorption qualities. Our practical 12″ x 12″ tile size makes installation a snap in any room. These are the perfect solution for rehearsals, radio stations, and more. Install tiles easily with spray adhesive, double sided tape, contact cement, or glue/caulk. 2 72″ x 84″ x 6″ $ 362.00 $ 383.72 Please email us with your zip code for shipping price with a carrier. 2 72″ x 84″ x 8″ $ 482.64 $ 555.04 Please email us with your zip code for shipping price with a carrier. Just call (248)-284-0002 or e-mail us with the size and quantity you would like to order. Please include your shipping zip code for accurate shipping price.